Want to build furniture yourself? 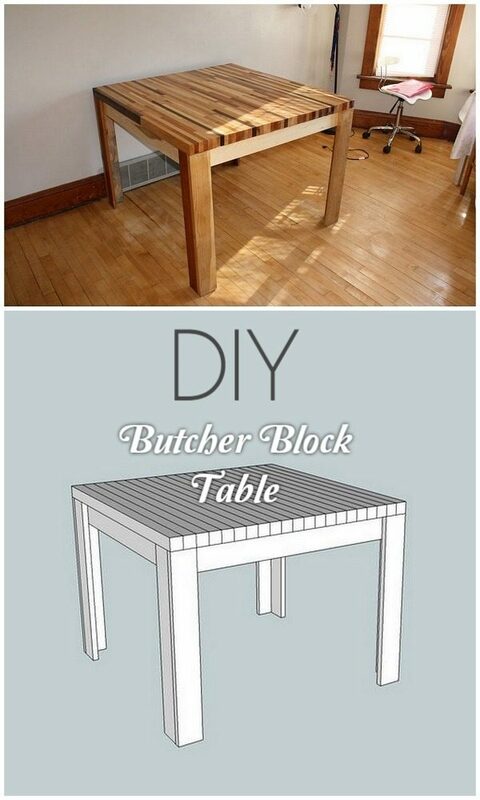 How about a DIY table? Here are 40 easy tutorials that will help you with your project. 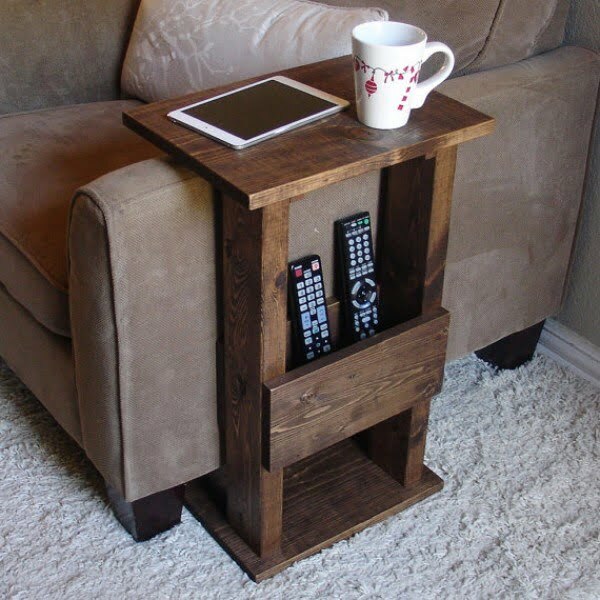 Do you want to build a DIY coffee table or a DIY side table instead? 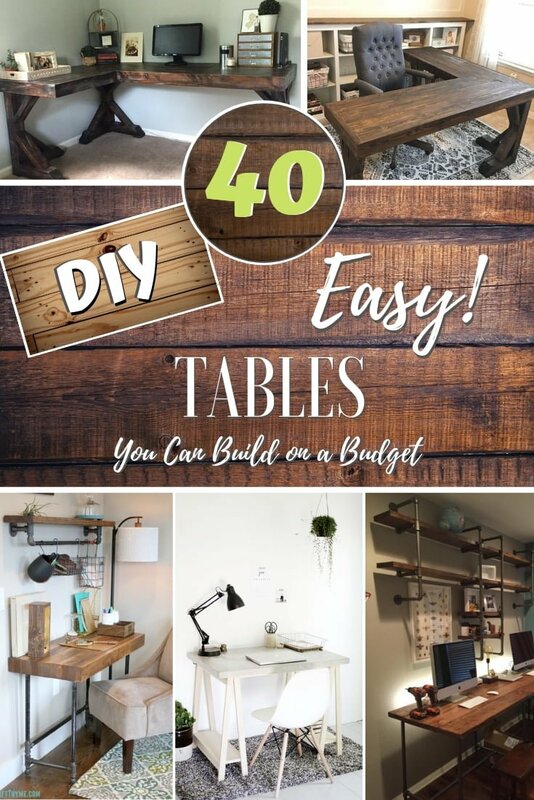 You can build these easy DIY tables even on a tight budget! When it comes to choosing furniture to complete your interior design, it can be a difficult and expensive task. Even a simple table can be hard to choose considering the options and the specific style you’re going after. Some of us yet choose to build something with our own hands. And even if you’re not a seasoned crafter, you can actually build a simple piece of furniture that will meet your needs and make a statement in your home decor. 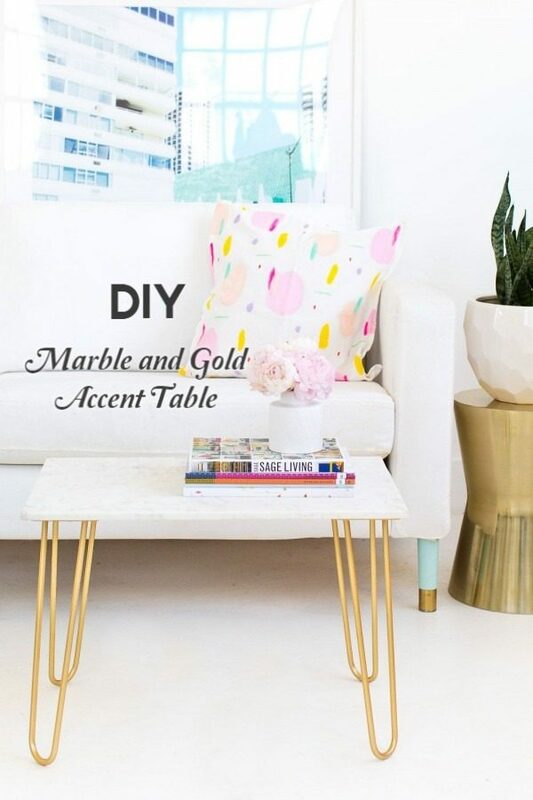 We have these easy DIY table tutorials that you can follow step by step and add lots of character to your home style. A concrete table top brings a very industrial style to your home decor. It makes a really great kitchen countertop too. If you like the idea of adding this material to your interior, follow this tutorial to build one. Looking for something fun and unique for your kids’ room? 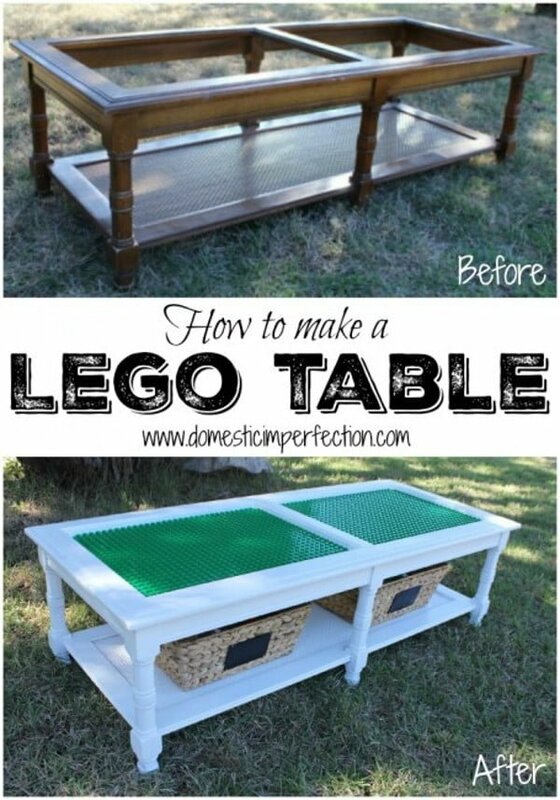 A custom-made DIY Lego table is certainly a unique addition. It’s as fun to use as it is to build. Minimalist furniture is great in that it requires a lot fewer materials to build and it creates a modern style. It’s also fairly easy to make. 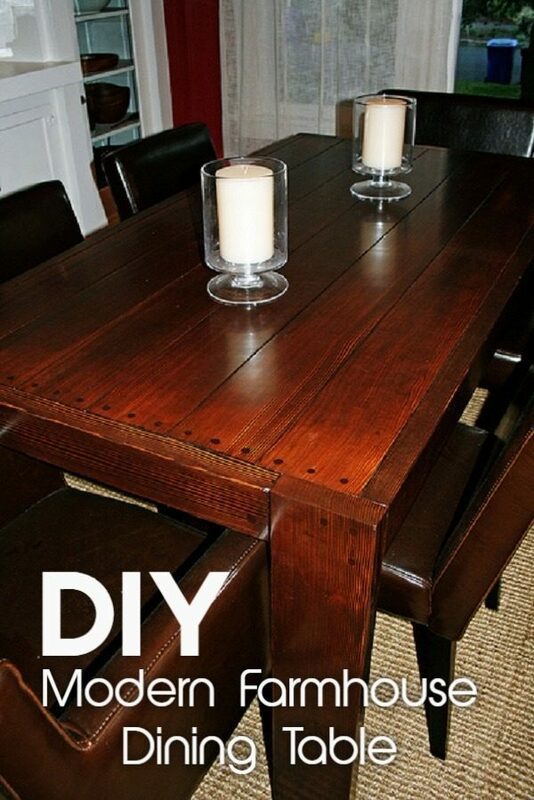 Build this DIY dining table by following the tutorials. 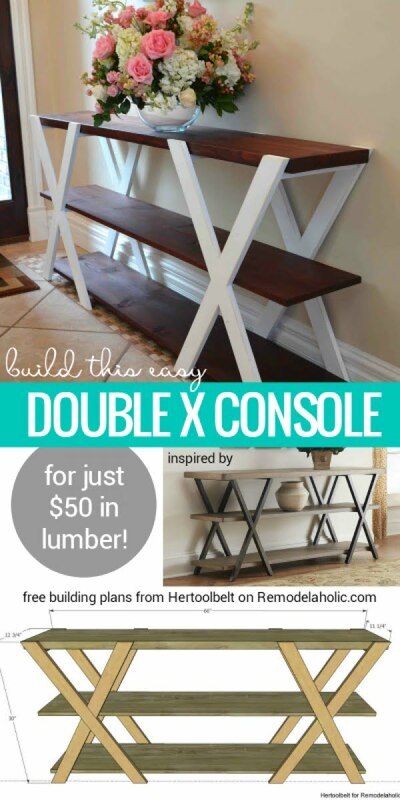 The double X frame console table has a lot of rustic charm and its design makes it easy to build together. Check out how to build one for under $50. If you’re looking for a vintage piece of furniture with lots of character, consider building this simple DIY desk. The plans are straightforward and you can achieve all the charm with paint job. 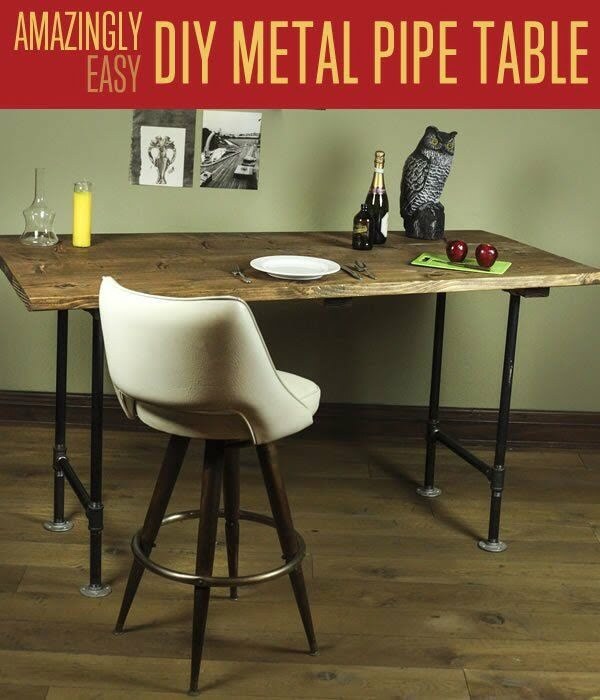 Using pipes in furniture design brings that industrial and rustic element to home decor. The project itself is a bit more complicated but it’s very well worth the effort. If you’re looking for a really simple and small table, this is a project for you. It doesn’t take much effort to build and you get a really unique piece of furniture with a lot of decor interest. 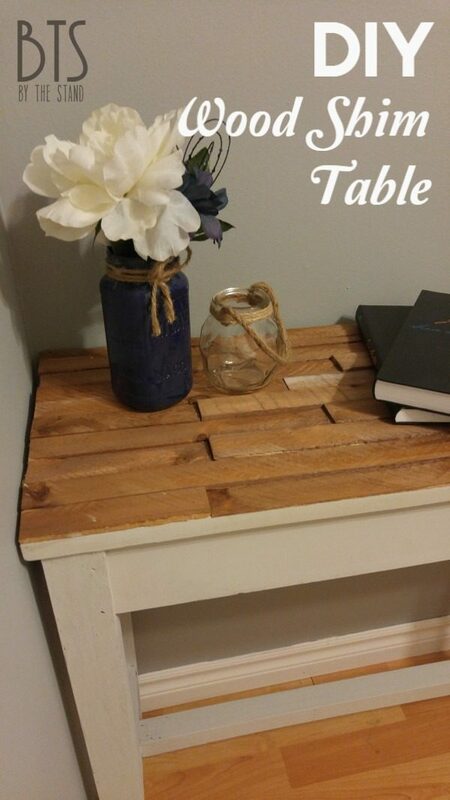 For that space behind the sofa, you can build an easy DIY table in rustic style. You can even repurpose materials for this project. Add some easy style to your home decor by constructing this mid-century nightstand for your bedroom. Plywood works really well but your can also paint it for a different texture. 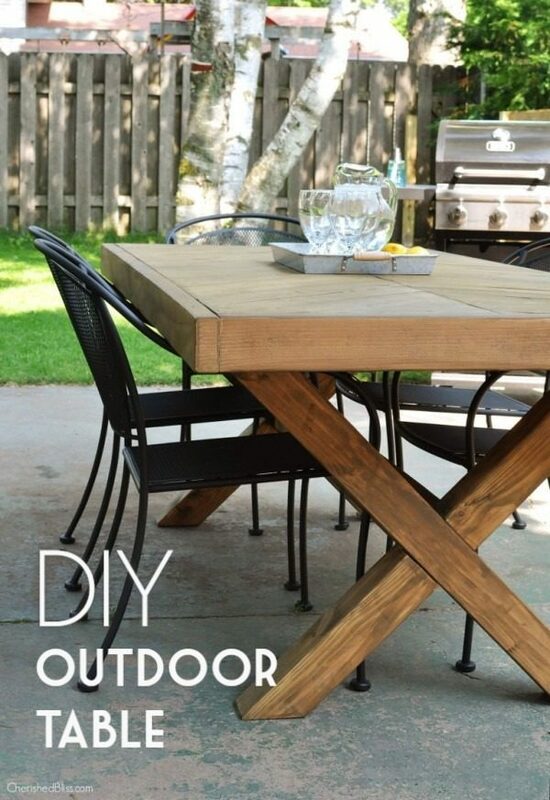 Here’s a DIY project for a really cheap small table for your porch or backyard. And it doesn’t have to be limited to the use outside – add more interest to your decor by using it inside. This idea for a side table is as functional as it is visually attractive. Add some rustic accent to your living room with a convenient piece of multi-functional furniture. Such as small piece of furniture can be so powerful with a lot of rustic style and warmth that it brings to your home decor. It’s fairly simple as a DIY project and very useful in small spaces. Brilliant designs are often really unexpected. 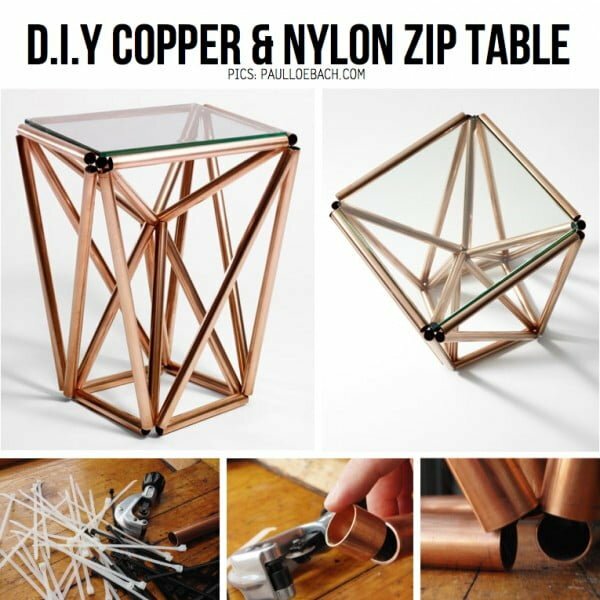 This geometric copper tube table is tied together with nylon zip ties. The structure itself is made sturdy by the network of triangulated shapes. It’s obviously an involved project but it’s a fun challenge to seasoned crafters out there. The X base of this simple wooden table adds some architectural interest to your home decor which is a fun way to decorate. 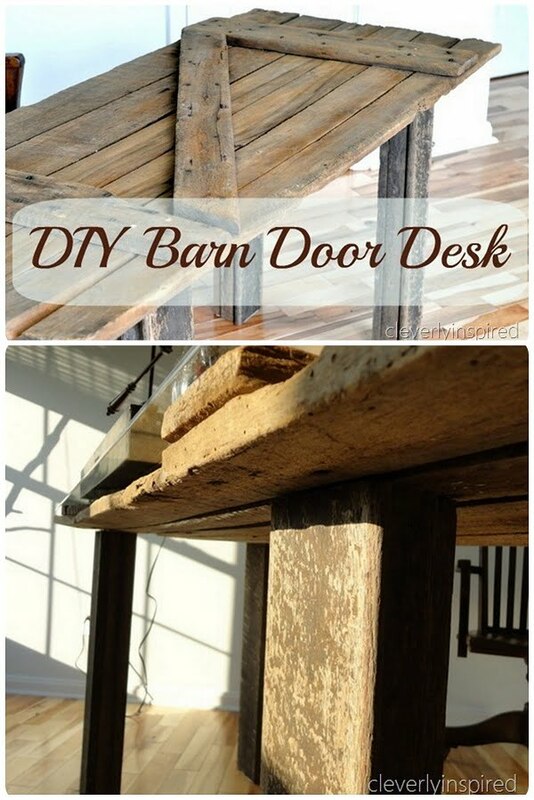 It’s a fairly simple project giving a touch of warm rustic style to your decor. 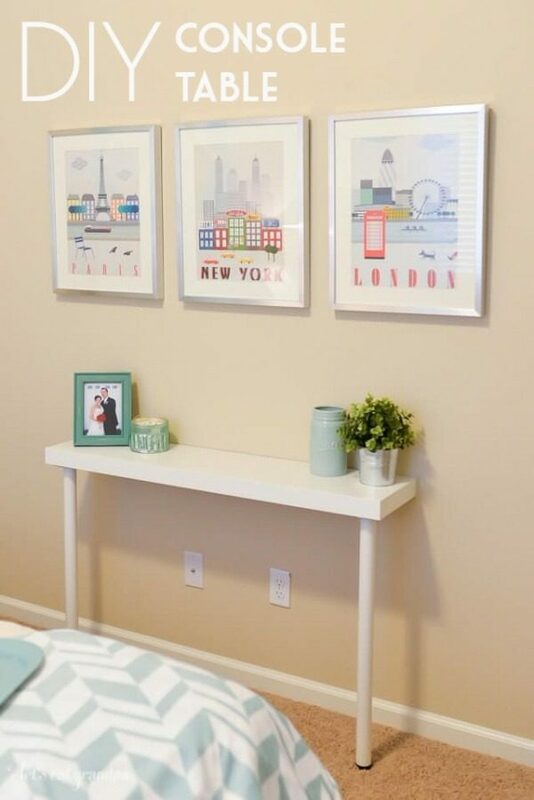 Another brilliant DIY project with plans from Ana White. 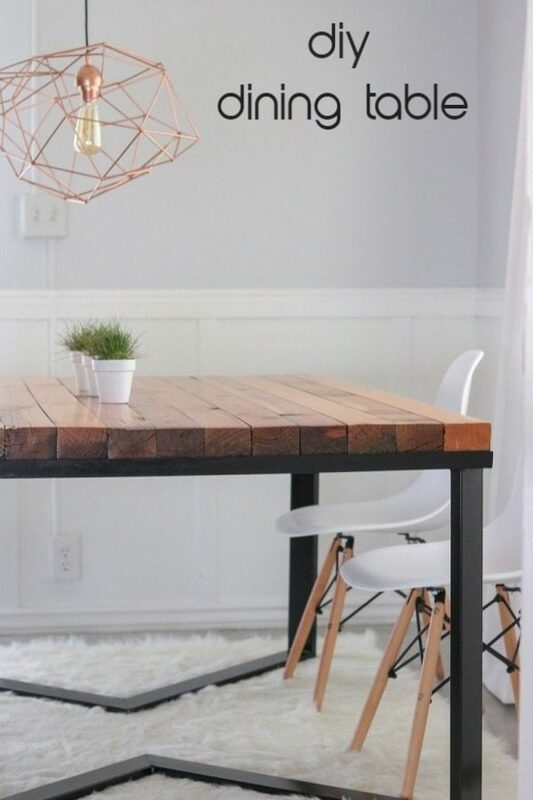 This table is simply adorable and well worth the effort to build for some more rustic accent in your home decor. This side table is simple but good looking with a hint of shabby chic style. And the best part about it is that you can easily do it yourself at home. 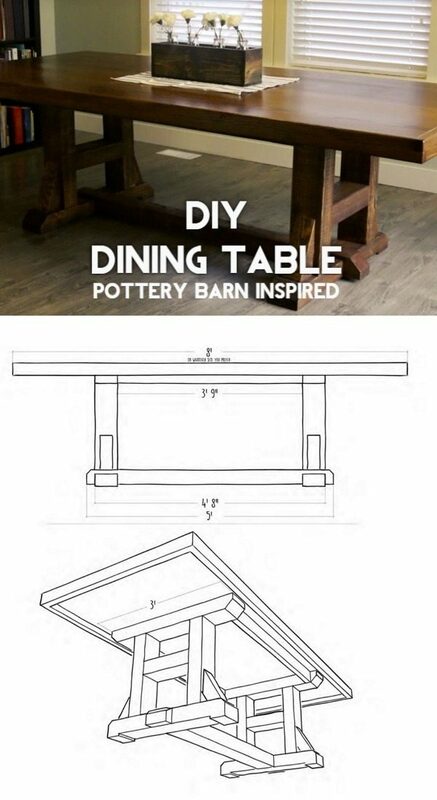 If you think you may use this table, follow the tutorial for the DIY project. If you want to create a rustic style breakfast nook at home, you can make this pub style table using the plans from Ana White. It’s a relatively easy project that you can take on to build these lovely stools and a table. Check out the tutorial for all the details. A picnic table is both a decorative and a very useful addition to your backyard or patio. If you plan on getting one, a pedestal picnic table is the perfect idea considering it can serve both adults and kids. To spice up the look of such a table, you can cut the top in a circular shape according to the tutorial. 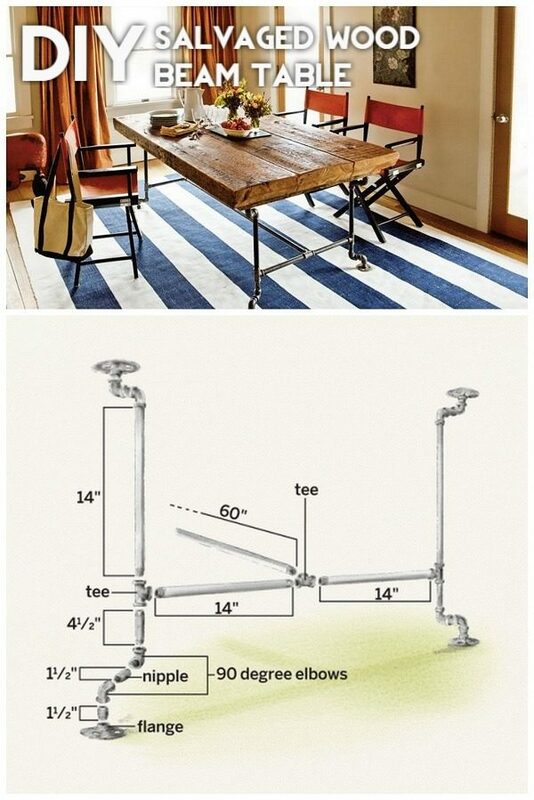 The wood and pipe table has rustic industrial appeal and makes the perfect decor accent piece. For this project you’ll need to get table boards and pipes from the hardware store near your home. 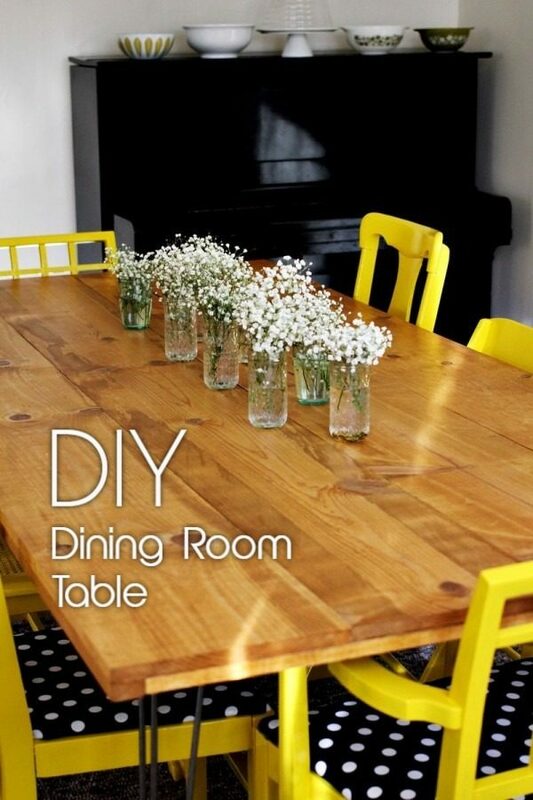 Follow these simple steps of the tutorial to have your DIY homemade table ready for use. It’s modern, futuristic and definitely makes a conversation piece. And you can DIY one at home. The short list of materials that you will need for this table includes a tempered two-way mirror for the top of the table, LED tape and a regular mirror. Check out the tutorial for full instructions. 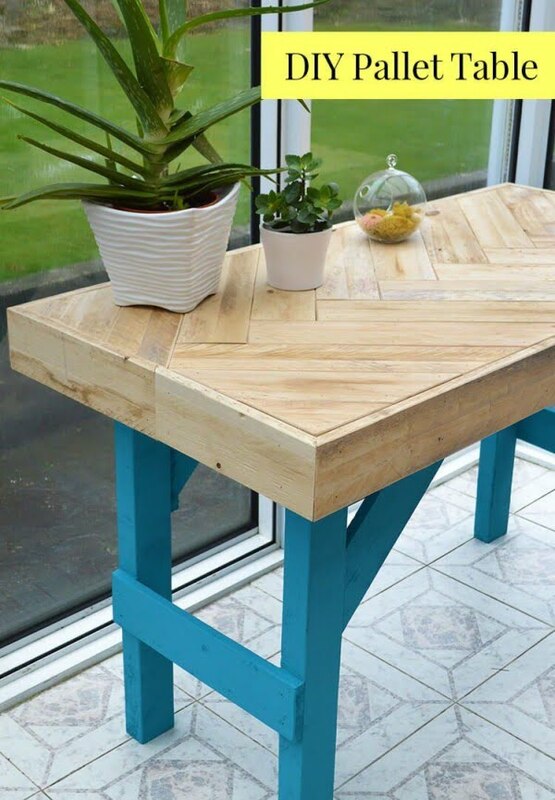 This type of a DIY table happens to be very appealing to the eye and cost-effective. You can easily make such a table by following through the tutorial. Having the right tools is crucial if you are to undertake this DIY venture. This narrow console table comes in handy when you need to manage small space but still want to make your rooms look elegant. You just need to get a board and fix the two legs using screws. The project will not strain your wallet and at the same time help you save on time. All that you need for this DIY project is an old piece of wood and some railings with a little renovation. Using a sheet of glass as the tabletop is essential when using salvaged materials. Check out the tutorial for the details. This console table helps you transform idle space into useful storage for your household products. The console table should be lengthy and narrow. Check out the tutorial for all the details to make one at home. 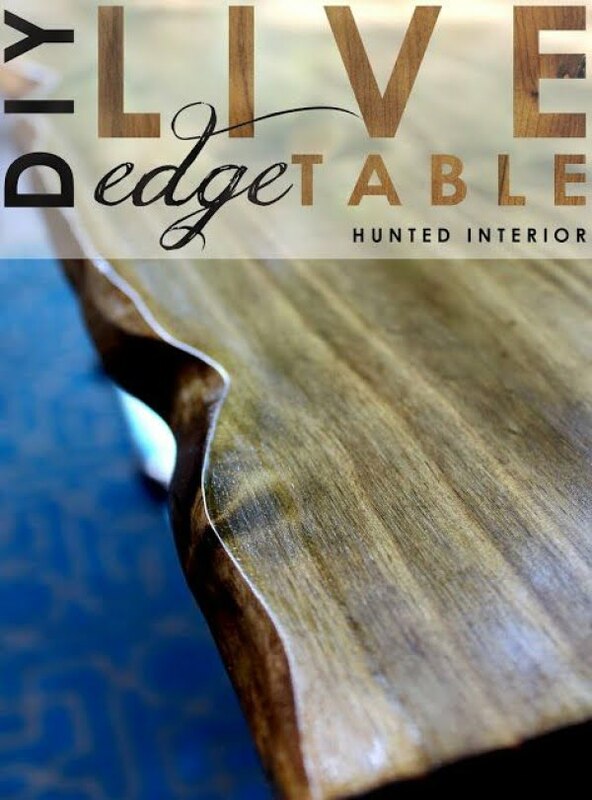 For this project, you’ll need to buy a desirable piece of wood from the store, then design a desirable shape of the live edge. If you already have the base in place, fix it to the wooden top using screws. You can as well make a hole in the middle to act as a holder for dining equipment. Get straight planks of wood which you will use to craft the frame and legs of your table. Nail the top to the frame that you have designed. To improve the appearance of this DIY farmhouse table, you can use wood stain. Decorations in the form of intricate patterns can also be engraved on the table. It is a very cost-effective as you rely on the use of old hardwood. However, you will need to employ thorough sanding to improve its appearance. Cut the wood then glue L-shaped legs to the top. The right tools will give you exemplary results. This kind of table has a very appealing appearance. 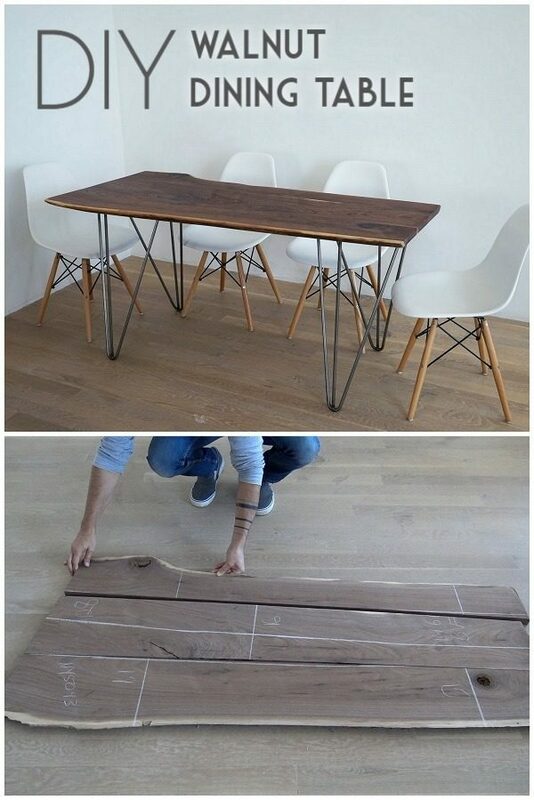 Anyone can build such a table with just basic woodworking skills. Get a durable pine board cut into dimensions of your choice. Then make table legs at a height that suits you. Screw these legs to the board after sanding. Once the table structure is in place, you can apply stains to improve appearance. The whole process of making such a table is simple because you only need to collect scraps of wood and bind them together in a pattern of your choice. 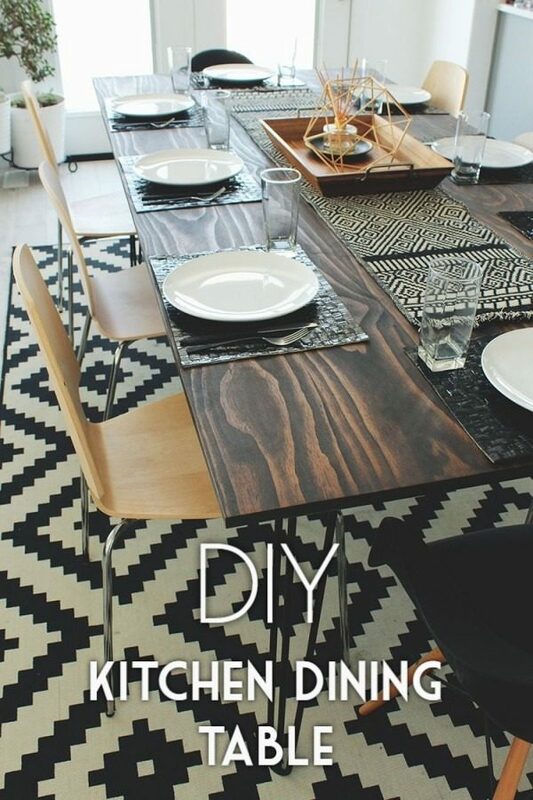 Make the top of the table by fixing each piece of wood with a nail gun. Then use leg screws to hook the legs. You can also apply paint if necessary. The main material in this project is a Walnut slab. Cut the slab into reasonable shapes and glue them together. Sand the resulting wood, then fill holes with tabletop resin. Hairpin legs as the base of the table are necessary for supporting the top of the table. Look for oak wood when making this dining room table. Assemble the pieces of wood together and join them using a nail gun. Sand the wood then fix the hairpin legs to the tabletop. A honey-colored finishing is ideal as the last decorative touch to such a dining room table. The table stands out and will comfortably blend in with the furniture in your house. A Kreg Jig is one of the essential pieces of equipment when constructing an outdoor table. Make chisel-shaped lap joints from the wood. Start by cutting the edges. Ensure that the joint legs are at 45 degrees. 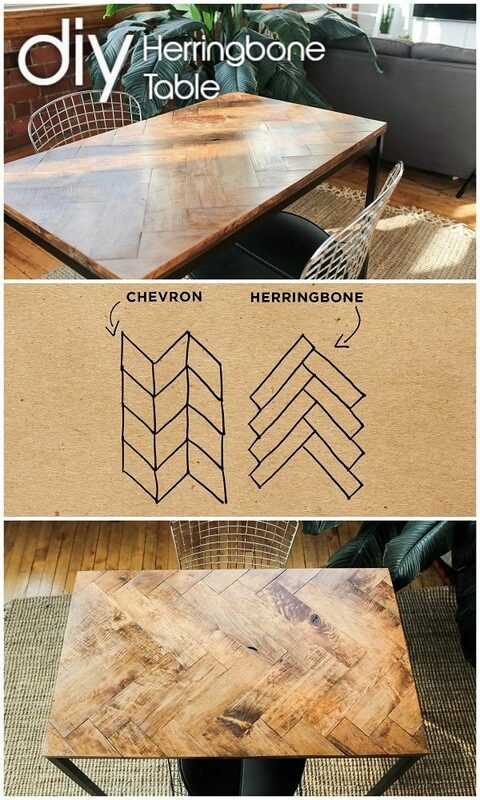 Assemble the table using Herringbone pattern and then stain the surfaces. Maple wood is recommended for this project. The herringbone pattern is quite easy to make if you follow the tutorial. The table adds tons of visual appeal to room’s decor and it can make an excellent focal point. The main materials for this project are wood boards from the hardware and 19 feet of Angle Iron. This DIY project is a little bit more involved as it requires wielding. Follow the instructions to build it at home. 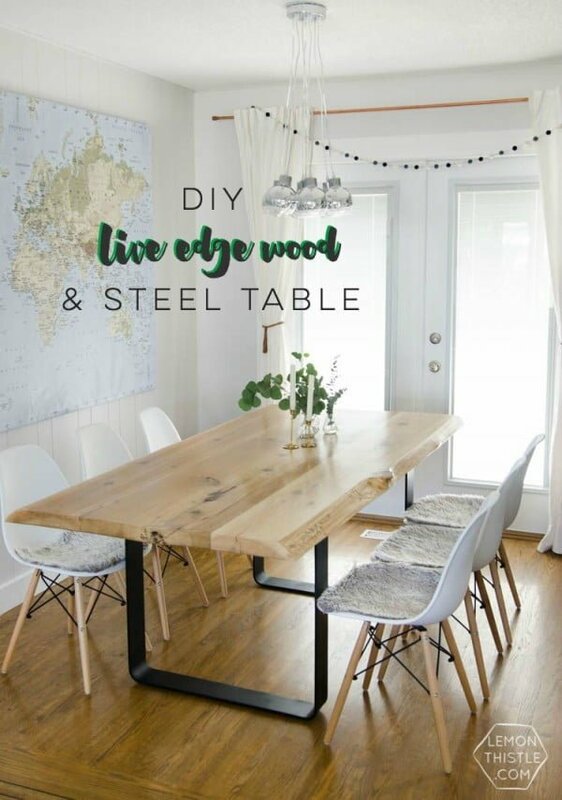 Use lumber wood when performing a DIY project for such a unique dining table. After making the table top, hook the base in six different locations underneath. Instead of screws, use heavy bolts when fixing the legs. The resulting appearance of the base should be triangular. Check out the tutorial for instructions. This piece of furniture is as functional as it is attractive to the eye. 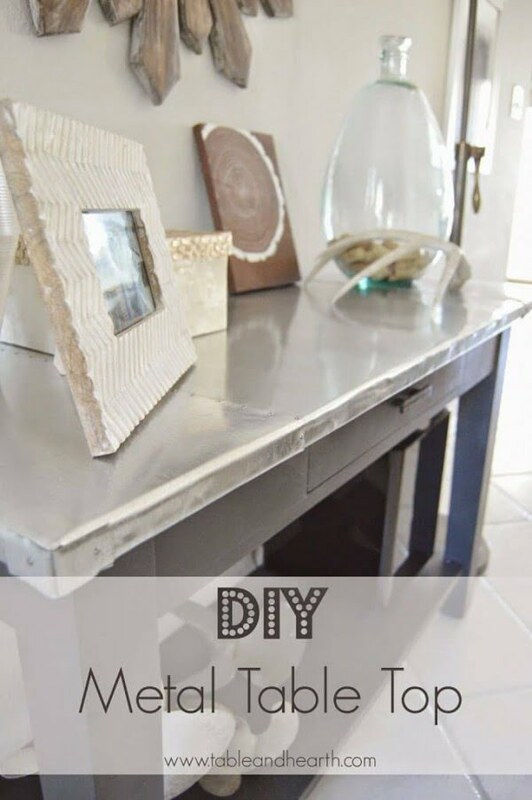 Make a mirror that folds down in to a table or desk. Such a table can easily be used as a kitchen bar, dining table or even home office. If you are using old wood, sand it to remove wooden flakes. Assemble the steel base and make pilot holes beneath the table top. Use bolts to hook the steel base onto the top. Apply wood glue and sand gently. For this project, acquire a marble board and hairpin legs from the hardware store. Use gold paint to color the hairpin legs. Let it dry then apply shellac spray on top. Glue the legs using liquid nail onto the marble board. Leave it out in the open for the liquid nail to solidify. The key idea of this project is reusing old salvaged wood. Look for fitting pipes and use them as the base. Repurposed wood and pipes make a rustic industrial style that makes the perfect decor accent. Check out the tutorial for instructions. This steel top table brings a great metallic accent into room’s decor. Paint the table with a color that coincides with the appearance of the metal. Bend the edges of the steel to come up with a desirable pattern. Cut the extra steel off and then nail the edges. You’ll need four large pieces of wood to make the table top. Use a color of your choice to stain the wood. This kind of table is ideal if you have a low budget. Check out the tutorial for step by step instructions on how to build it. You can buy packs of wood shim at affordable prices for this project. 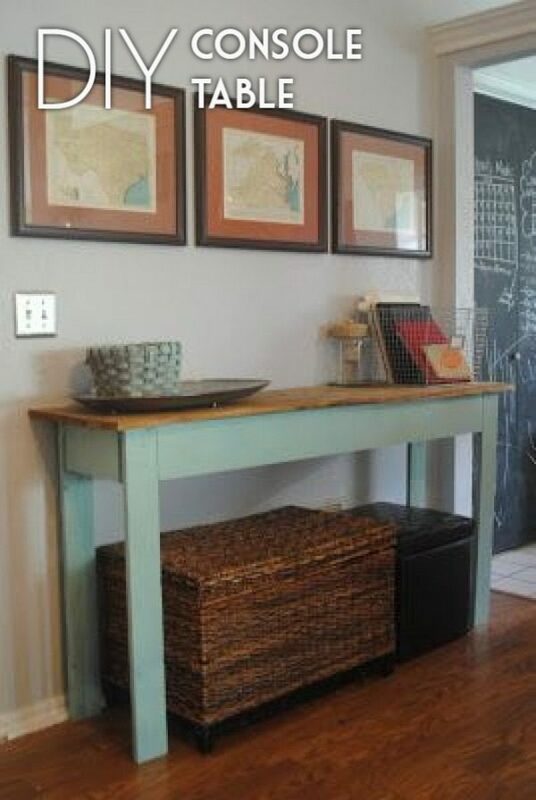 Apply paint of a color you prefer to the legs of the table. Use liquid nail for sticking the wood shims together in a unique pattern. Let it dry and then apply a stain of your preference to the table top. You can choose to add wood polish as the final decorative measure to give your table a glossy look.